PLEASE NOTE HIGHLANDS AND ISLANDS NORTHERN IRELAND ETC WILL INCUR EXTRA SHIPPING COSTS.WE WILL ALWAYS QUOTE BEFORE SENDING. THESE ARE VERY SLIGHT SECONDS WITH ONLY VERY SMALL COSMETIC BLEMISHES AT A BARGAIN CLEAROUT PRICE. USUAL PRICE £96.00 CLEARANCE PRICE 59.95. The Reader ultra high definition daylight reading floor lamp enables the user to see with a clarity not seen in normal lighting. It raises the contrast of print in such a way as to make the black of print appear blacker and the background whiter. The brightnes of the lamp enhances the focussing power by increasing the depth of field. These lamps help to stop the tiredness when reading for prolonged periods, ideal for all professionals who need to read a lot. All metal construction the lamp can be adjusted to make a full floor lamp, a half height floor lamp, or a table lamp. Simply be either removing the central poles. ULTRA HIGH DEFINITION BULB SUITABLE FOR ANY SMALL EDISON E14 SCREW FITTING. THE MORE YOU BUY THE CHEAPER THE BULBS BECOME. ULTRA HIGH DEFINITION BULB SUITABLE FOR ANY STANDARD SMALL EDISON SCREW FITTING. 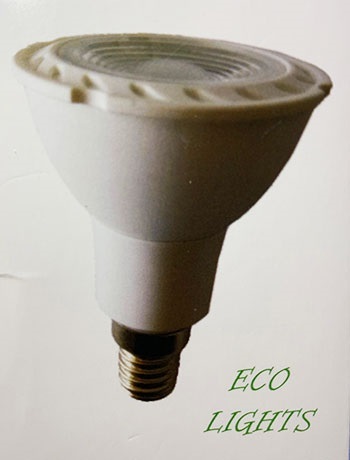 Daylight 6 watt E27 LED Cob bulb, suitable for all lamps with an ES eddison Screw fitting (E27), where the user wants a high output lamp that burns very little electricity, these are the green bulbs of the future. Amost no heat , so can be used very close to the user or heat sensetive work. These lamps will fit our Roxy, Betsy, and Ruby Lamps, as well as our new range of the Reader, Toby , Conrad ,Rio, Bella, and Manhattan lamps. Also any lamps you already have with an eddison screw lampholder. The light out put is the same as a 75 watt bulb without the heat or power consumtion, also ideal for reading as the clarity of this type of lamp raises the contrast of black print. This bulb is the best we have ever seen for colour and reading, it makes colours more vibrant, and print stands out from the page. Ideal for the user who struggles in ordinary lighting , even better than our usual energy saving daylight bulbs.They are the ultimate in high contrast lighting. P+P £5.85PLEASE NOTE HIGHLANDS AND ISLANDS NORTHERN IRELAND ETC WILL INCUR EXTRA SHIPPING COSTS.WE WILL ALWAYS QUOTE BEFORE SENDING. A brand new lamp for 2016, with a beautiful polished chrome finish. 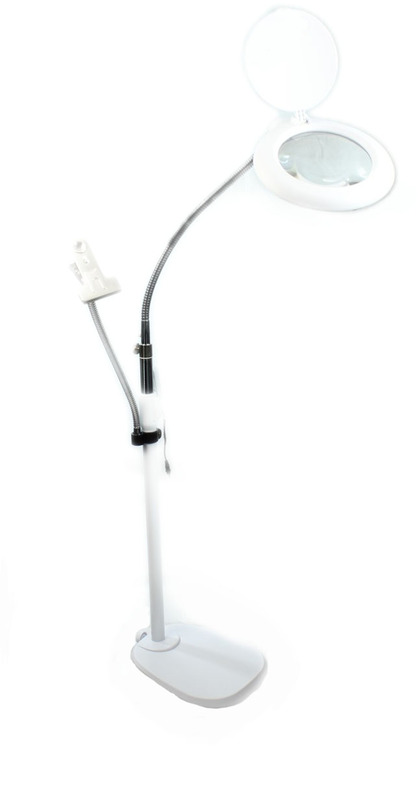 Daylight led ULTRA high definition 6400k floor lamp burns only 6watt of power. These are the best bulbs for this sort of use we have ever seen they have a clarity that other bulbs do not have. They make the best reading lamps that money can buy. 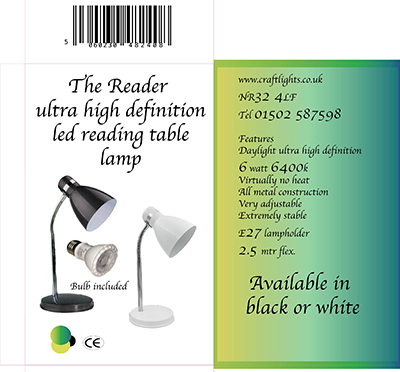 The Reader ultra high definition daylight reading lamp, low heat amazing clarity from a small all metal table lamp, with a long flex, take out of the box and ready to go. 2. 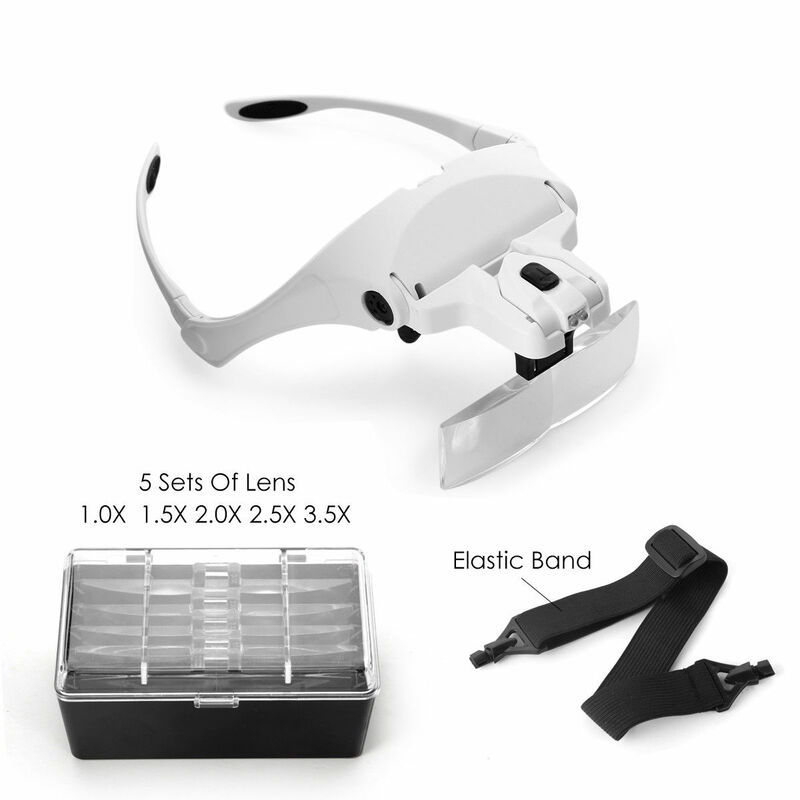 Glasses Leg & Headband Switchable: Press the side button to take down glasses legs and mount headband for replacement; This design solves the problem of heavy loading. 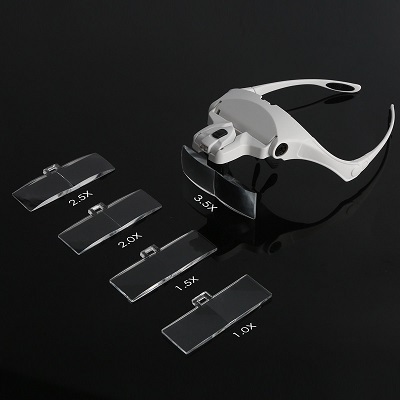 Common bracket-type eyeglasses magnifier is easy to fall off due to the heavy weight of lenses and led light module, while this item can solve such a problem completely. If a long time use is needed, you can transfer the eyeglass legs into headband state, which can work more comfortable and never falls down. 3. Non-Fall Structure: Lens and lens holder can be firmly interlocked by each other when you hear a crisp click sound during installation, with easy snap on/off design. 5. Adjustable Lens Angle & LED Light Angle: Lens angle and led lighting are both adjustable, making the light source precisely cast to objects to be observed, very convenient use. 6. High Brightness LED: 2LEDs built in, with easy push-type ON/OFF button to control. 9. Power Supply: Powered by 3*AAA batteries(Battery not included). closer the distance is, the wider the view field will be, and vice versa. 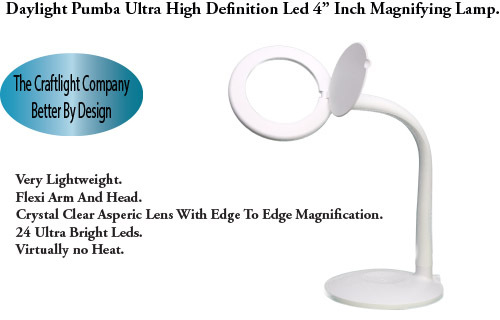 PUMBA ULTRA HIGH DEFINITION DAYLIGHT LED LIGHT WEIGHT MAGNIFYING LAMP. 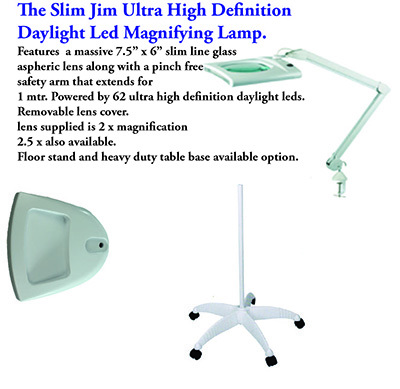 BRAND NEW FOR 2016 THE SLIM-JIM ULTRA HIGH DEFINITION LED MAGNIFYING FLOOR LAMP. FEATURES A MASSIVE 7.5 X 6.2 INCH ASPHERIC LENS FOR EDGE TO EDGE CLARITY. IDEAL FOR ALL CRAFTS, HOBBIES, AND ANY WHERE YOU REQUIRE DISTORTION FREE MAGNIFICATION WITH THE CLARITY OF THE 62 SUPERBRIGHT DAYLIGHT HIGH DEFINITION LEDS. VERY LONG REACH 80 CM PINCH FREE SAFETY ARM. 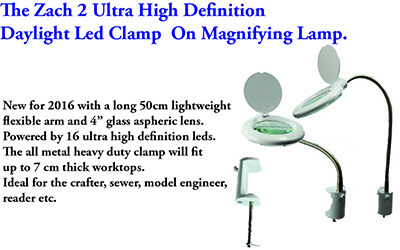 ULTRA HIGH DEFINITION LED CLAMP ON MAGNIFIYING LAMP. MASSIVE 7.5 x 6.2 INCH SLIMLINE ASPERIC LENS FOR DISTORTION FREE VISION. HEAVY DUTY 5 SPOKE FLOOR STAND ON CASTERS FOR EASE OF MOVEMENT. BRAND NEW FOR 2016 THE MAXIMUS ULTRA HIGH DEFINITION LED MAGNIFYING FLOOR LAMP. FEATURES A MASSIVE 7 INCH ASPHERIC LENS FOR EDGE TO EDGE CLARITY. IDEAL FOR ALL CRAFTS, HOBBIES, AND ANY WHERE YOU REQUIRE DISTORTION FREE MAGNIFICATION WITH THE CLARITY OF THE 62 SUPERBRIGHT DAYLIGHT HIGH DEFINITION LEDS. MASSIVE 7 INCH SLIMLINE ASPERIC LENS FOR DISTORTION FREE VISION. A brand new slimline lamp with a massive 7" inch 2 x magnification aspheric glass distortion free lens. 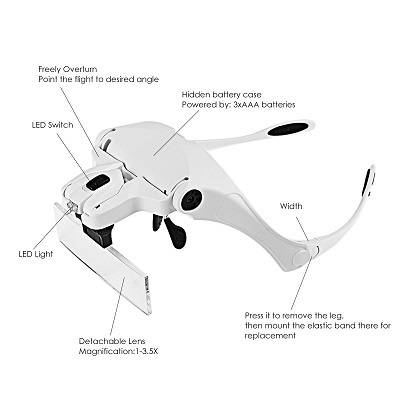 The head is adjustable to many angles and can be locked into position. The safety arm has a reach of 1 mtr. comes as standard with a heavy duty table clamp, but a heavy table base and floor stand are also available as an option. Powered by 56 ultra high definition leds for that superb clarity, and very low heat as well as economy of power consumed. These are built to professional standards for commercial use. 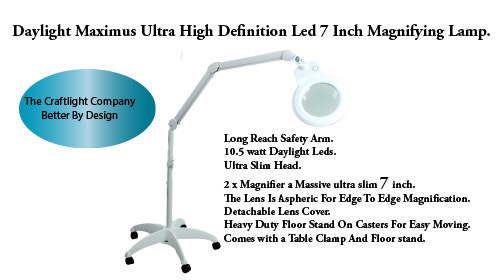 SLIM JIM 7.5" X 6.2 " PROFESSIONAL BUILD DAYLIGHTULTRA HIGH DEFINITION LED MAGNIFYING LAMP. The new Slim Jim magnifying lamp is a new slimmer version of our professional 7.5 x 6.2 inch aspheric distortion free lens , with a longer reach 1mtr safety arm (no pinching) . It is lighter in weight and available with 62 high definition powerful leds. These give a clarity never seen before in magnifying lamps along with very little heat. the Sliim Jim comes as standard with a heavy duty table clamp, a floor or table base is available as an option for this model. The difference this makes to working on small items i.e. jewelry,modelling or engineering inspection/repairs is incredible I cannot believe how easy it is to work with compared to the smaller ones that are around.In the description it would be helpful if the magnifying power (3 diopteres) was stated. Set this up on my work table and once clamped in feels very stable. Comes with a large, distortion free, lens and a bright annular light. Just to let people know the magnification is 2X which is not over powerful but I guess provides a compromise between magnification and avoiding distortion (which makes it easier on the eye). My eyesight isn't too bad but I would venture to say that the 2X magnification, combined with the bright light and squarish lens, would be quite helpful for someone struggling to read such as a paperback. I bought this to enable an old person with poor eyesight and dexterity to effortlessly read letters, bills etc. He had previously had a variety of cheaper magnifiers but this is far better. It is certainly big but the return for this is a huge, beautifully clear and perfectly lit lens that after a moment or two you focus beyond and forget you are looking through. This has the advantage of making longer use much more comfortable. You don't have the small area of focus or the distortion and poor depth of field of other products. It is stable using the table clamp and is held at any angle. It is heavy though and could not easily be repeatedly set up and put away by an old person. It fully succeeds in meeting the above purpose but it would succeed equally well I think in any application where its size is no problem and quality of view is the priority. It seems very well built and it should last. I don't know how it compares with very expensive professional type magnifiers but at the price I paid I consider it a bargain. Daylight 5 inch full spectrum 6400k Magnifiying Lamp. Brand new model for 2014 featuring a large 5 inch aspheric lens, powered by a powerful daylight full spectrum 22 watt 6400k bulb. This is the ideal lamp for the professional looking for a heavy build lamp that does not tip over easily. Use as a craftlamp, inspection lamp, modelling lamp, nails, and also a very good reading lamp. A built in lens protection cover, this also enables the lamp to be used without the magnifiyinhg lens. The Zach2 is a progression from the Zach lamp we introduced last year, but with a longer arm, slightly larger lens and brighter leds. The table clip has been replaced by a substancial all metal clamp, that will fit 7cm work surfaces. The lens now has a built in cover to protect it, and also to direct more light downwards when used just as a powerful daylight lamp. The lens is aspheric and glass for amazing clarity with no distortion. The Zach2 is the perfect lamp for crafters and model makers of all types. The lamp is almost without heat and is a high definition led type for that extra clarity that is so important for close up work and for the visually impaired. This is a brand new concept in a magnifying lamp, designed by our own team of innovators. It Is a development of all the years of producing this type of lighting into the craft and reading market. The lamp is powered by an array of 48 daylight 6500k leds, which have virtually no heat but gives an intense light, suitable for many crafts, but also can be used as a very effective reading lamp, as this colour of light raises the contrast on print, enabling the reader to see a much sharper image. The lamp is height adjustable with a click stop mechanism, raises from 1.0 mtr to 1.6 mtr height making it suitable to go over even the highest chair, but at the same time being able to be lowered right over the workpiece. For the craftworker who needs magnification there is a 130mm (5") distortion free aspheric lens concealed in the shade, which can be revealed at the flip of the protective lid. The lamp is powered by both mains and battery. It can be clipped to the table or workbench as well as table or floor mounted. the clip is a very robust steel one . There is provided a book/work/patternholder arm as standard. Only just bought this lamp but wow what a difference the light is from normal lighting so bright , will help me a lot when using it for my cross stitching and crafts etc . Had a little problem when assembling the light head but after discussion with the seller that was soon sorted out , seller was very happy to help, can't wait to use it now ! Solid, well-made and versatile 4-in- 1 craft lamp.Prompt delivery and well packed. Wonderful lamp - buy it - you will love it!! Absolutely love my new lamp - perfect my close work on cross stitch. Only very slight criticism is the lift up cover does block my view of TV when in use - would be good if it slid across to side rather than lift up. Overall though this is a perfect purchase for anyone doing close work and the 48 led lights are perfect illumination. Also light arrived in 2 days rather than 3-5 days as recommended!! Fantastic lamp. 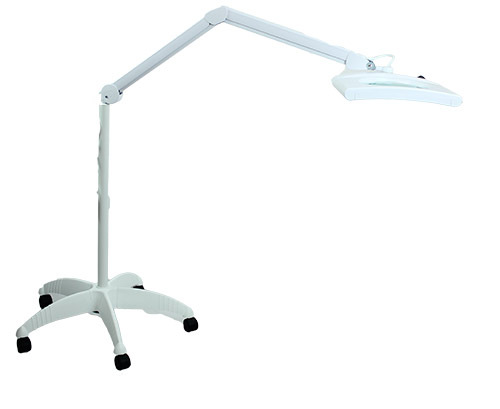 Easy to put together with lots of options as to use - floorstanding, reading lamp or clip to bench. The light is fantastic and the magnifying glass is wonderful! Bought for my wife as a Christmas present. She loves it. Has a high quality look and feel. Nice bright light and good size glass. Easy to put together and take apart. Good reach over chair arms. Heavy base means that is it very stable in use (but more of a lump to carry around). Not used the battery option yet. Table fitting also adds to the flexibility. What it was also really excellent for was lighting up the family jigsaw over Christmas - I hadn't thought about that - made doing the jigsaw much easier. Purchased as a Christmas present for my wife. The lamp apears well made with a heavy base to prevent toppling. The fact that this is a 4 in 1 lamp means it can be used in all manner of situations. I especially like the fact that you can plug into the supplied battery pack when no power socket is nearby or available. 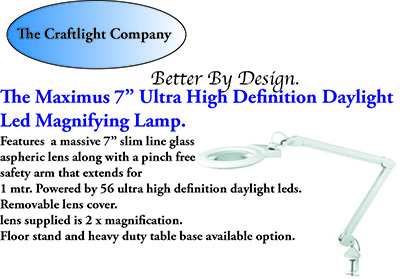 Excellent magnification and more than adequate light from the LED's. All in all, If you were considering buying one, It's not the cheapest and neither is it the most expensive but my wife is happy and so I would certainly recommend it. This is my second lamp. The disappointment is in needing to replace the whole thin when the bulbs failed as they cannot be removed for replacement. Love this lamp. It's bright and flexible. Love the fact it can run on batteries so I can take it anywhere with my sewing. quick delivery and exactly as advertised. Great lamp. Not too heavy to move about. Makes craft work much easier even if just using the lamp without the magnifying glass. A lamp I could never do without. Order the lamp On the Easter weekend and it was delivered by the following Thursday. Absolutely love this lamp which I bought for micro crochet and don't know how I managed without it. I read by it as well. The assemble was easy with very clear instructions. Really good am very pleased with it. Just as described. Excellent, really strong and well made. Bright light and no distortion in the magnifying lens. The arms stay where they are put and the base is well weighted for stability. I have already recommended this to my friends. Excellent piece of kit ideal for all crafting needs. I am a beauty therapist and was recently looking to replace my day light magnifying lamp. needed it for. I do a lot of close up work - lash extensions etc which I find this lamp perfect for. treatment room. In essence a treasure of a find. Would I recommend it - most definitely! A serious and highly functional lamp .. I can't find anything wrong with this light. It is a 'craft' light but shines at fixing all manner of electronic devices. The size of the magnifier allows for large area viewing. The value of the battery-power mode should not be overlooked. You can disconnect from the mains, connect to the battery pack, and take it wherever you like without having to plug in - i.e. it is portable in floor stand mode as well as in clip on or desk modes. With the three modes, and generous height adjustments, it probably copes with most reasonable circumstances. It is solidly built. Mine came with one of the connectors in the battery pack missing. An email, rapid reply from Julie, and 2 days later the replacement unit was in place. It seems well worth the price. Perfect product. Just what I was looking for. Excellent quality, fast delivery, the magnifier is a godsend. And it's so versatile. I don't know how I managed without it so far. Love it! Thank you! 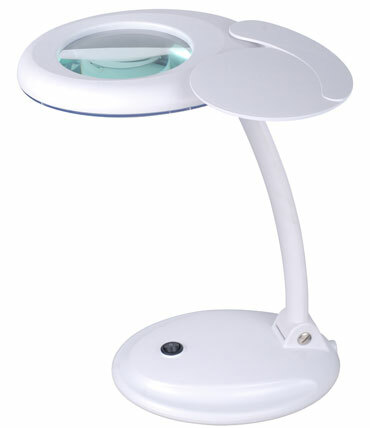 This is a brilliant light & with the magnifier everything is so clear. It's very easy to assemble & well made too. It was well packaged & the delivery was extremely quick. Would definitely recommend! This was ordered for a friend so I haven't used it myself. She does a lot of needlework and was having difficulty due to deteriorating eyesight. However she was delighted with it and has used it both as a floor standing light and table light. She also uses it as a light without the magnifying element. It answers all her requirements and is well worth the money. I love my new light/ magnifier it really is all you need and more. Cross stitchers it's a must have . "I have to say this one is far better then the trio, the head rises to a nice height and light much stronger better set up all round I recommend it I even made a you tube video about it as I sew and need good lighting. The company are also quick service A+++"